Do you ever buy a polish and decide that it's just soooooo not right for the current season, so you put it away and save it for later? For me, HARE's King of Carat Flowers was one of those polishes. I couldn't wait to try it, but it just didn't seem right for fall/winter. I knew I wanted to wear it in the spring, and I finally gave it a try the day before Easter! 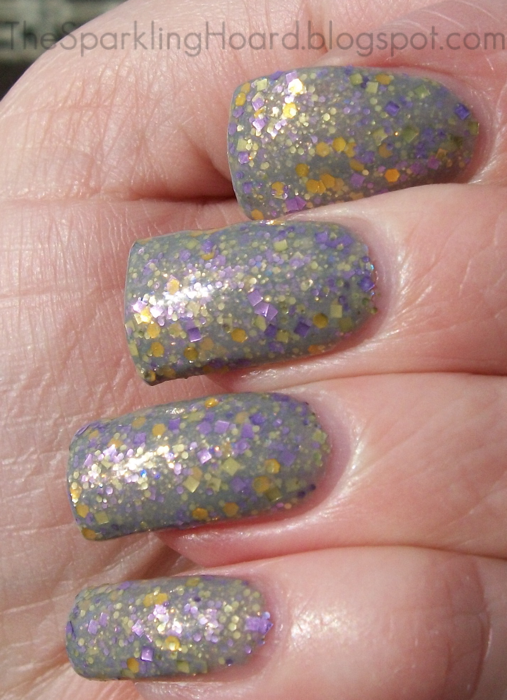 King of Carat Flowers is a very complex polish. The medium gray crelly base is packed with metallic goldenrod hex glitters, metallic light yellow square and hex glitters, metallic lavender square and hex glitters, purple iridescent glitter, and gold shimmer. Application was easy and dry time was average. I used 2 coats. Pretty, right? I think this polish is great for people who want to do pastels without looking super girly. The gray base really tones things down and makes it look more sophisticated than cutesy. King of Carat Flowers is $11 for 15mL on Llarowe. You can also find HARE Polish on Etsy. You can stay up to date on HARE Polish news by following them on Facebook or on their blog.